This installation of the Aarrow Ecoburn wood burning stove took place in a mansion block in Putney, London. The client knew exactly what they wanted. 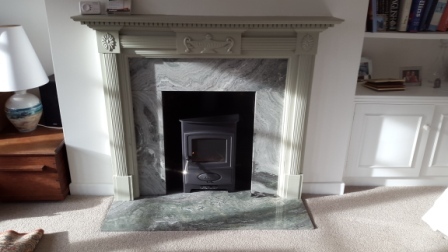 Reviewing the existing fire surround, we showed them a range of wood burners that would suit their requirements. The Arrow Ecoburn wood burning stove (Plus 4 version) was the preferred choice. The Aarrow Ecoburn stove is a stylish contemporary stove with a large fire viewing window and height adjusting legs. It can burn wood or solid fuel and has a preheated air wash system for clean glass. Defra approved and highly efficient.